For many young hockey players with NHL aspirations, the annual entry draft is a tremendous milestone in their careers. If you happen to get drafted, that is. 211 players were chosen in this weekend’s draft, though there were thousands more from various countries that had been vying for those same spots. For some young players, going undrafted can be emotionally crushing. For others, powerfully motivating. And for both it can come as a shocking surprise. Below is a quick rundown of some of the more surprising left-behinds, as well as their final rankings according to NHLNumbers.com‘s aggregate ranking system. The Top 100 list and the site’s ranking rationale can be found here. 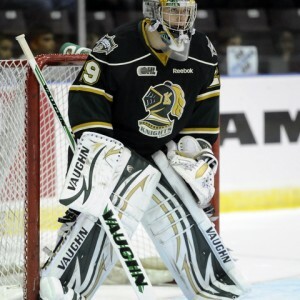 Despite scoring a combined 54 points in 62 games, split between the defensive-minded OHL champion London Knights and last place Erie Otters, Fox’s name went uncalled on both days. He has impressive skill and hockey sense, but his reputation has been trying to recover from rumoured off-ice personal issues that seem to have scared away potential draft suitors. Fox has already been invited to attend the New York Rangers prospect camp this coming week, and will be looking to demonstrate enough skill to make teams interested again. In most draft rankings, Slepyshev was ranked as a second round talent. In some draft rankings, a first round talent. Skill is not a concern, as he scored 7 points in 39 games in Russia’s best league, the KHL, as well as 7 points in 6 games at the World Under-18s, but Slepyshev has not done enough to convince NHL teams that he would ever come across the ocean to play in North America. Could have been a good fit as a 7th round project, but apparently the risk was still too great. Lundberg is a big, strong potential power forward that scored at a pace close to 1st round draft choice and fellow Swede Filip Forsberg, with 18 points in 51 games in Sweden’s second best league (Forsberg had 17 in 43). Impressive stats, however, weren’t enough for him, as he had been scouted as needing serious work in both his skating and his puck control. If he can improve on those issues, and if his numbers continue to impress going forward, he might make himself too appealing to pass up on in next year’s draft. “Twenty-four goaltenders were selected in the 2012 NHL draft. Since he’s now completed his required time in the OHL, Houser can sign a free agent contract with interested teams and begin his pro career. But still, come on: being the OHL MVP isn’t enough to get drafted? It would be considered a huge accomplishment for any of the 211 chosen players if they won that honour in the future. Probably the most surprising non-pick of the draft. Twin brothers Matt and Ryan Rupert formed a formidable checking line duo last season for the Knights, shutting down top opposing lines and chipping in timely offense. Both are lifelong Toronto Maple Leafs fans, so it was a dream come true for Ryan when he was taken by the team with their 6th round pick. Matt, however, wasn’t as lucky, as he was left without a selection from any team. The Leafs could have taken Matt with their 7th round pick to complete the feel-good story, but chose Swedish defender Viktor Loov instead. Matt has been invited to attend the Leafs’ development camp, and will likely do so, but could still be drafted by another team in next year’s draft.